Google and LG Electronics are working together to develop and provide hardware and software technologies to upcoming smart city development projects that utilize information and communication technologies to increase the efficiency of urban services. The US tech giant announced the partnership and its details at the first Google Cloud Summit in Seoul, Thursday. The two firms plan to work with real estate developers and investors to build smart towns powered by artificial intelligence, the internet of things and big data analytics. “Google and LG will be providing solutions that contribute to the ‘smartness’ portion of new buildings and structures (built as part of smart towns),” Rhee In-jong, vice president of IoT and entrepreneur-in-residence at Google, said during the summit’s press conference. For instance, the envisioned smart city solutions would monitor air quality, lighting and temperature levels, and based on the data gathered recommend the most cost-efficient energy consumption model. Such complex procedures would run smoothly on one platform, he said. As smart city solution partners, LG Electronics would take charge of building the IoT-compatible devices, while Google would provide back-end technology capabilities such as cloud, AI and machine learning needed to store, process and analyze data generated by connected objects. The smart towns envisioned by Google and LG include housing clusters, offices, commercial towns, hotels and business complexes being planned by real estate developers and investors today, according to Rhee. The Google executive did not point to any specific smart city projects or potential sites under consideration, saying the two firms are still in the process of developing various technologies for now. “As we continue our (smart city) technology development, we will have to carefully consider which sites we want to provide our products to,” Rhee said. Looking ahead, the US tech giant is open to new partnerships with smart city-related businesses in Korea and abroad, said the executive, when asked whether the company was considering partnerships with local companies other than LG in Korea in the future. The Google Cloud Summit is a regular conference held by Google to share the latest updates and news regarding Google’s cloud computing technologies with clients. 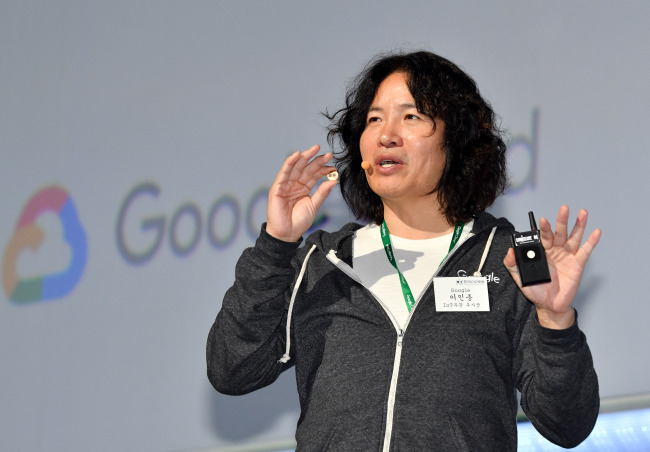 It was organized in Korea for the first time this year, signaling the importance of the Korean market for Google’s cloud business, according to Rhee. Rhee, is also the former chief technology officer at Samsung Electronics, which competes with LG Electronics in various tech arenas including smart home devices. He was recruited by Google’s cloud computing business unit in February, and is based at Google’s headquarters in Mountain View, California.